An interesting old biscuit tin lid which dates to about 1891. 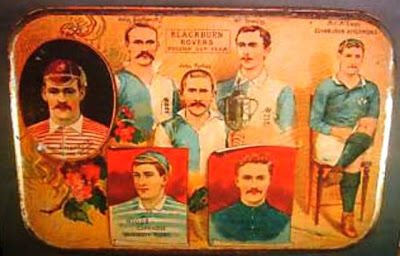 The middle one of the three Rovers players was none other than John Forbes (1862 -1928), who captained Rovers and led them to two FA Cup Final victories in 1890 and 1891. Unfortunately, ill health for Forbes, led him to an early retirement from his football career in 1893. 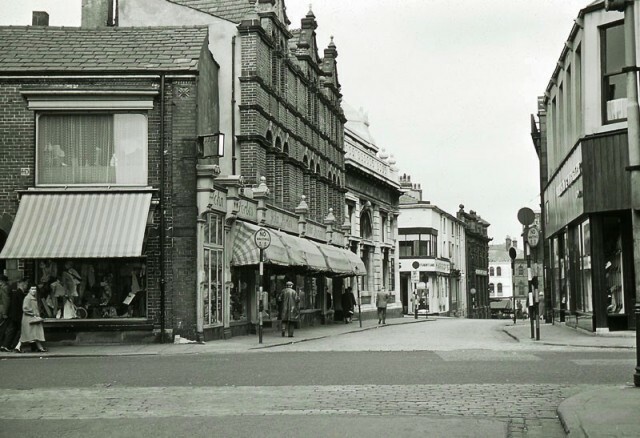 Shortly after first arriving in Blackburn (1889), from his native Scotland, Forbes had set up a gentleman's outfitters, which over the years diversified a little to sell sportswear and school wear. I think his first shop had been on the corner of Lord St & Victoria St just opposite the old market square, but when that property was demolished to make way for the Littlewoods store in the 1950's, they relocated to the shop many of us remember, on the top end of Lord St / corner of Northgate (see lower photos from the 1960's). COURTESY OF THE INTERNET (LID) AND JOHN EDDLESTON (NORTHGATE PHOTOS). I got my first school uniform from Johnny Forbes in 1961/62 for St Peter's C of E on Byrom St.
Would the Wimpey shop 3 doors down from Forbes have been the first "Fast Food" outlet in Blackburn as I don't remember any others prior to it ? I would guess that one of the multitude of ''Fried Fish Dealers'' (chippy's) that had been around since the late 1800's would have been one of the first fast food outlets. But yeah, that Wimpy Bar was about the first of its type that I remember, when I was growing up. Wasn't there also one on Railway Rd, somewhere were that amusement arcade is now? It was very long and narrow that one on Northgate. I did go in it with my mates a few times, but that would have been the late 60's or early 70's. Quite a few of John Eddleston's photos were taken around Lord St / Lord St West / Corporation St / Nothgate / King W. Street. I always think it's a pity he didn't get a shot of the old Wine Lodge while he was there. The Morris Minor is a long way from home. It was originally registered in Hastings between October 1959 and May 1960. 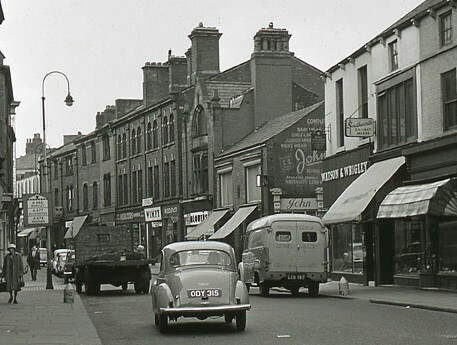 One of those properties, along from the Wimpy, is where, in more recent times, they found the Mitchell & Kenyon films. Hi - It's a kind offer, but I wouldn't want them personally. Surely they belong in your family archive. I've just had a quick look in a book I have and Fred had quite a career didn't he? He won 3 Engalnd caps while playing for the Rovers and then moved on to West Ham. Later joined the merchant navy and then returned to football as a coach at non league Barking. Art played for the Rovers and then Southampton. Maybe the Rovers archivist (sure they must have one) would like the photos, though they obviously have at least one photo, as there's one of Fred in my book. I know there's a lady at Mellor Library recently been compiling some general history of the village, I'm sure they would be interested in them too. Let me know how you get on and thanks again.